Product #21449 | SKU DIV-201-230 | 0.0 (no ratings yet) Thanks for your rating! The Kino Flo Diva-Lite 201 Fixture (230VAC) is a compact, lightweight fluorescent fixture that delivers broad, soft and diffused lighting quickly, easily and efficiently. 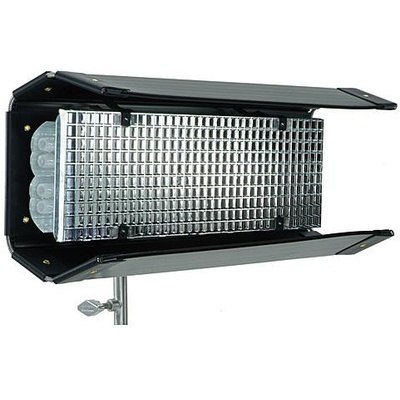 The fixture is centre mounted and includes a reflector and built-in barndoors. It holds two 55 W fluorescent bulbs--daylight- or tungsten-balanced--that can be quickly switched (no need to wait for them to cool down, they're always cool). Included in the kit are a gel frame, a silver louvre, and a 16 mm Kino 41 lollipop w/baby receiver. Supplied for use with 230VAC. Note: Fluorescent bulbs are not included.